Your air handler is what distributes conditioned air throughout your home. When damaged, you quickly feel low airflow, if any airflow at all. When cool air fails to reach all areas of your home, your air handler may be to blame. Call our CJS Air Handler Specialists (937) 488-4758. Get dependable air handler repair and replacement solutions to keep cool. At CJS Heating & Air, we can help you with our expert air handler repair, replacement, and installation services. 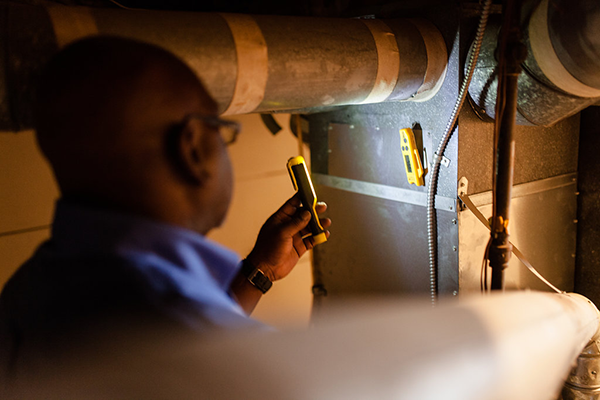 No matter the model or location of your current air handler, we will be able to help you get it back up and running in no time. Should the need arise for replacement, we can help you find a system and install it in your home in no time. How does an air handler work in your system? The air handler is the main component in the air conditioning process. Without it, you wouldn’t be able to receive any air at all. When you turn on the air conditioner, the air handler works by conditioning air, and then transferring it through the ductwork that runs throughout your home. It does this by cooling the air using internal coils, and then pushing the air out into your ductwork. When it breaks down, you will quickly find yourself in a panic trying to restore your air. At CJS Heating & Air we offer the highest quality air handler repair services. Our staff will arrive at your home, find the source of the issue, and repair it, restoring your unit to working order efficiently and effectively. What causes damage in these units? Age – Is your air handler over 10 years old? As the air handler ages, it also deteriorates. This can result in leaking coils, damaged components, and faulty electrical systems. Eventually, the system will breakdown, cutting off the flow of air in your home. Dirty Filters – Your filter is responsible for keeping your air handler clean. If it’s not replaced regularly, dust, dirt, and other particles can find their way into your air handler. These particles can clog the coils, resulting in the loss of temperature control in your home. Mechanical Failures – Belts, motors, and other mechanical parts are all susceptible to deterioration as a result of the passage of time. Eventually, these parts will fail, and take with them the ability to cool and heat the home. Without proper repairs, you will find yourself without airflow for some time. When these situations crop up in your home, it’s important to get professional services. Our experts have the skills and tools needed to provide you with timely solutions that will help restore the flow of air to your home. Additionally, we can perform regular maintenance, which will help keep your air handler working at the highest level possible. When should you replace your air handler? With a new air handler, installed by our professionals, you will enjoy efficient and convenient heating and cooling in your home. With our factory trained staff, you will rest easy knowing that all air handler services are completed to the highest level possible. Contact us today and get the highest quality solutions that won’t break the bank. Is your home suffering from low airflow? Does it take hours to cool down your home? Chances are you have a damaged Springfield air handler. Call (937) 488-4758 and get the best repair and replacement services today!